Sangria is one of my husband's and my favorite drinks to make during the Summer months when we are either hosting or attending a party. It can be as simple or as complicated as we'd like and very easily scalable to however many people we are making it for. For this batch of sangria, we chose to use lots of fresh Summer stone fruit, like peaches, plums, and cherries. 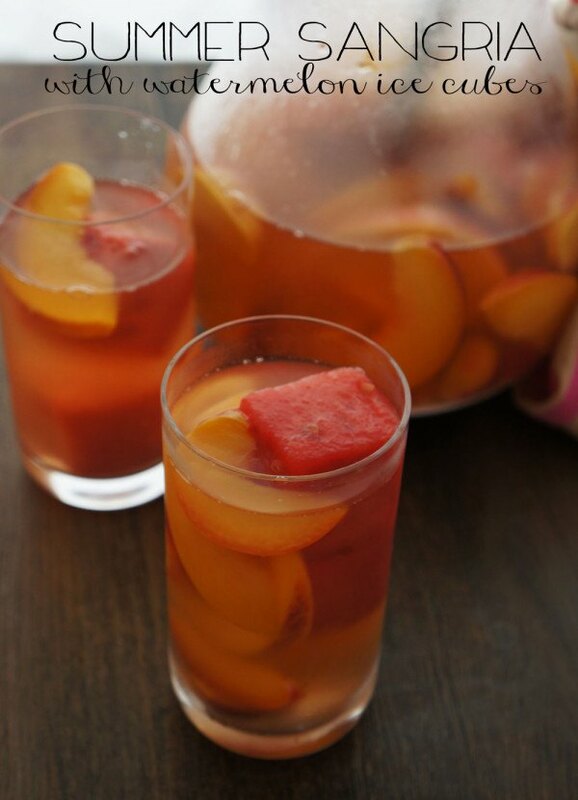 Peaches are wonderful in sangria because the really give off a lot of flavor, making the finished product sweet, yet still a bit tart from the wine. To make this drink even more Summery, we added watermelon ice cubes. We stole this idea from a bar in Raleigh we visited a couple weekends ago, but I will probably be adding watermelon ice cubes to all my drinks for the rest of the Summer. It's genius! And they are super easy to make: 1) cut up some watermelon into cubes; 2) freeze. There is no real rhyme or reason to chopping up fruit for sangria. I like to leave the pieces relatively large so they don't get too mushy sitting in wine for a couple days, but not so large that you can't fish a piece of fruit out of your glass and eat it, in all its drunken glory. And for the wine...well, again, there are no standards (at least none that I am aware of). I prefer to use wines that are a little bit sweet and fruity already. But not too sweet. I stay away from Chardonnays and Rieslings. Somewhere in the middle, like a Savignon Blanc or Pinot Grigio. For this batch, we used a Spanish wine (I can't think of the grape variety for the life of me), which seemed pretty appropriate. We also like to throw in a splash of whiskey, like Crown Royal (or the Kirkland equivalent, as in our case). Partly because we like the added flavor, and partly because my husband will only drink a fruity drink if there is whiskey in it. We let our sangria sit for at least two days. My husband wanted me to emphasize TWO days (he literally walked in as I was typing and said, "please put on your recipe that we let ours sit for at least two days"). You definitely could make this the night before and serve it the next day. However, you won't be doing your sangria any favors. All the flavors from the fruit will not be as fragrant. After two days, the fruit has gotten a chance to break down and release its juices and the bite from the wine is a bit less noticeable. I think sangria is just the perfect drink for the Summer. The Spanish really knew what they were doing when they came up with this idea. It is just so refreshing and flavorful. However, I can sometimes forget that I am drinking wine...which can be a problem. So pace yourself! One batch can last you a while. If you don't think you can finish it off after about four days, strain out the fruit and store the rest in the fridge. You can add back in fresh fruit when you are ready to serve again. What is your favorite Summer drink? In a large pitcher combine the peaches, plums, cherries, wine, and whiskey. Stir and muddle the fruit slightly. Let sit in the refrigerator for at least 24-48 hours. Meanwhile, cut 1-2" slices from the watermelon and remove the rind. Cut the slice lengthwise into 1-2" strips, then crosswise to for cubes. Store in a single layer in a plastic freezer bag in the freezer for at least 4 hours, or until frozen. To assemble, place 1 to 2 watermelon ice cubes in a cup. Fill the glass up with sangria. Using a slotted spoon, spoon in extra fruit.